﻿ Best Price on Hummingbird Nest in El Fosforo + Reviews! The Hummingbird Nest is property set in the mountain area of the Arenal Volcano outside the city of Fortuna, less than 300 metres from the Arenal Lake riverbank. 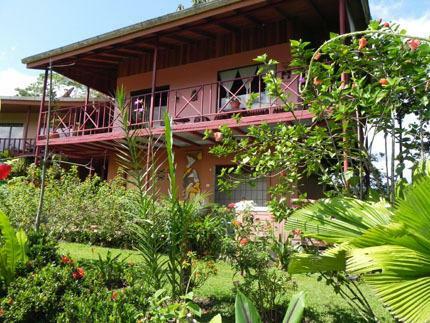 It offers panoramic views of the Arenal Volcano. The rooms at this bed and breakfast have plenty of natural light and feature a fan and a private bathroom with a hot-water shower. All units offer panoramic views of the lush gardens. The Hummingbird Nest has an equipped kitchen guests can use prior request. Within walking distance, guests will find 4 different restaurants where local and international dishes are served. The property also has a hot tub and promotes activities like horseback riding, fishing, hiking and bird watching. Arenal Volcano National Park and the Lake are 20 minutes’ drive from the property, while the zoo and Conservatory Lodge are 5 minutes’ drive away. The Sky Trek is 10 minutes' drive away. A deposit via bank transfer or PayPal is required to secure your reservation (see Hotel Policies). The property will contact you with instructions after booking. Please note that there is a minimum 2 night stay.